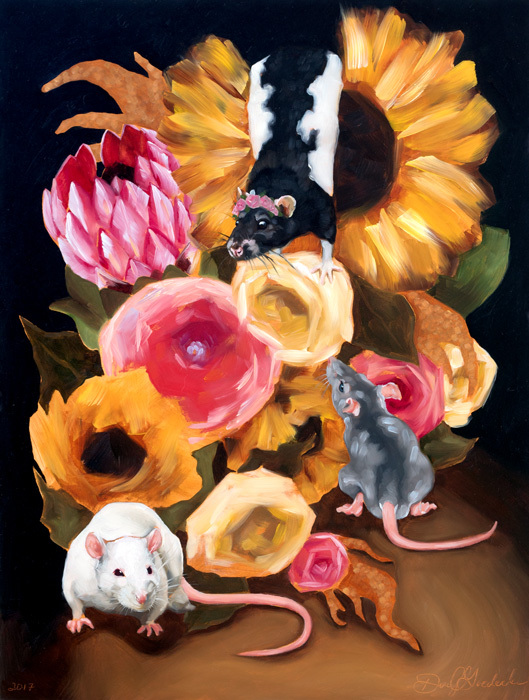 Three sweet little ratties play amongst the sunflowers, garden roses, amaranth, protea, and dahlias. This is an original painting from my Misunderstood series, celebrating the less-loved and sometimes feared creatures of the world, by adorning them in flowers and vibrant colors. The paintings in this series are all oil on panel with 2″ deep cradled wood sides that are stained a dark spanish oak color to compliment the dark tones of the imagery.